Very Poor Service and Very terrible management . Once they have a sale from you treat you like crap they also dont houner warrenty. Hi there, My name is Saik and I am a regular customer at Dodge. I bought a Dodge Journey 2014 at 2015 with warranty of 4 years. Being honest not even 2 months I had to take it to the Dodge Service Center as the leather from the Dash started to puff up and it was looking like pretty bad. As I had warranty I took it to the dealership and they looked at it and took few pictures. When I asked them when can they fix it or book an appointment to do so, they said they can do it after 3 days and gave me schedule to work on my Suv, and then I asked for a courtesy vehicle as I work Full time and my wife works part time and we had a new born baby, they said it might take few more extra days to get a courtesy vehicle as they get very busy, So I waited an week but never got a call from them. So I decided to go back there and talk to them and they said they couldn’t give me a courtesy vehicle after I waited an week or more as they asked me to and still no help at all, So I had to use there so called courtesy van to get home and they kept my Suv for few days and I had to use their ‘‘van’’ to get to work and they were never on time. And my wife had to take kab to get to work, which was very painful when you have to waste a decent amount of money to kab for 4 days. This time I am having way bigger problems: There are Rattling sounds coming from front and passenger side, My suv doesn’t like to shift while going uphill, Rattling sounds coming from the back, Seat cover is peeling off, seat adjuster cover is loose and doesn’t work properly etc. Like before I took it to the dealership, Booked an appointment and this time I mentioned about what happened before and asked for a courtesy vehicle and like old time they asked me to wait for few days to get a car and the agent I was dealing with gave me the word to call me when they get courtesy car for me. Two weeks gone, never got a call from anybody. So I decided to go to the dealership again today. I found the same agent that had deal with me last time and he also recognized me and he straight out said he couldn’t give me courtesy a vehicle and was acting like my time doesn’t really matter for him and also started telling me, some of the things might cost me money to fix and my car is not even an year and half old and I still have warranty. And he took me to the receptions desk to explain it to me with a lady on the desk. She told me the same thing and asked me if went 4 by 4 with my front wheel drive 2.4 liter Suv. After that she took some pictures and promised me to get a courtesy vehicle tomorrow. They still couldn’t give me a time to bring my suv in. Now after couple of hours I get a call from the Dealership service manager Named kaal King that I couldn’t get a courtesy vehicle as my suv doesn’t have full coverage insurance and treated the way that he was never supposed to. He still didn’t even give a schedule to bring my suv in or anything. And he accused me that I was being rude to his agent and started to saying about bunch of policies that they never told me while buying the Suv. And then I asked for his name and he was not willing to give me his name and he was the Service manager of that place and what not. I am very upset and mind blown that he treated me like that, when I was a customer. While buying the Vehicle they acted like we were the most impotent customer for them and now I getting treated like nobody not even a customer. Now I dont even know if they gonna fix my car or not. I am so disappointed and sad. Never expected this from them. I am never recommending anybody to go there and I was planning on buying the dodge Durango this year but after this frustrating and disrespectful experiences, now I changed my mind and never buying or going back to dodge. I owned a Toyota, Mazda, Buick, ford but never had any problem. Very bad customer service and very bad manners. These folks saved the day for us...literally. In Kamloops from the coast on business for the day, we discovered that wed blown a rear differential pinion gear seal (from drive shaft) in our truck. We headed to Rivershore Dodge who told us that they might be able to fit us in the next day (Saturday). After 20 minutes of further pressing about parts, courtesy cars etc., they indicated that Kamloops Dodge might be able to help us immediately. 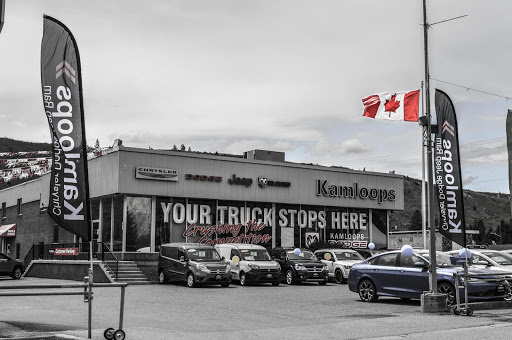 We rushed over to Kamloops Dodge who as efficient and calm as anything, told us that they could get it done. With dog in hand we waited in their lounge and in short time got the word that all was good and that we would be on our way by 4:30 pm. The cost was more than reasonable, the service great and the staff (both service and sale) were absolutely awesome! We really cant say how grateful we are that they were able to help us out. Thank you so very much!